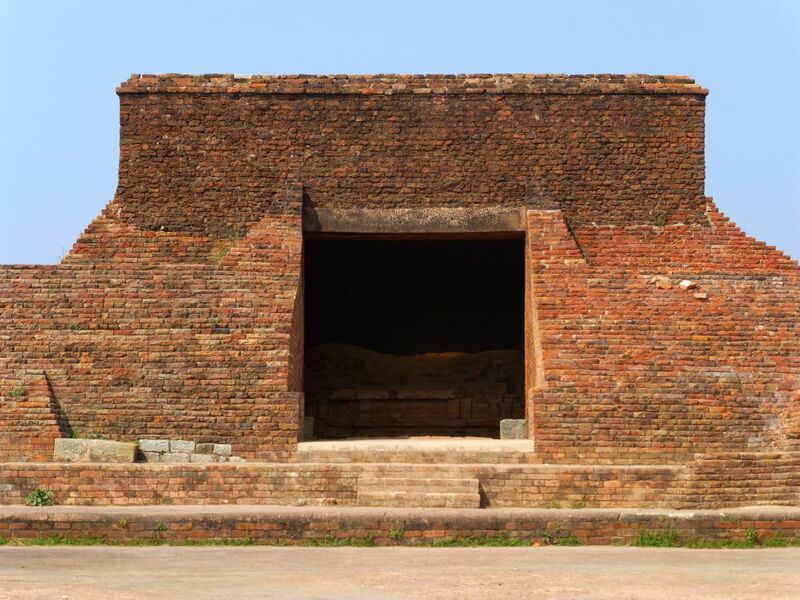 I am pleased to share an article titled ‘The Seventeen Pandits of Nalanda Monastery’ by Professor James Blumenthal Ph.D. who gives a brief account of Nalanda University and its great influence upon Tibetan Buddhism. I pay my respectful tribute to Professor Blumenthal who passed away on October 09, 2015. May LORD GOD bless his soul. TIBET AWARENESS – THE GREAT MASTERS OF NALANDA. TIBET AWARENESS – THE GREAT MASTERS OF NALANDA. ACHARYA NAGARJUNA. TIBET AWARENESS – THE GREAT MASTERS OF NALANDA. ARYADEVA. TIBET AWARENESS – THE GREAT MASTERS OF NALANDA. ASANGA. TIBET AWARENESS – THE GREAT MASTERS OF NALANDA. VASUBANDHU. TIBET AWARENESS – THE GREAT MASTERS OF NALANDA. DIGNAGA. TIBET AWARENESS – THE GREAT MASTERS OF NALANDA – DHARMAKIRTI. TIBET AWARENESS – THE GREAT MASTERS OF NALANDA. GUNA PRABHA AND HIS DISCIPLE SHAKYA PRABHA. TIBET AWARENESS – THE GREAT MASTERS OF NALANDA. BUDDHAPALITA. TIBET AWARENESS – THE GREAT TEACHERS OF NALANDA. BHAVAVIVEKA. TIBET AWARENESS – THE GREAT MASTERS OF NALANDA. ACHARYA BHAVAVIVEKA. TIBET AWARENESS – THE GREAT MASTERS OF NALANDA. CHANDRAKIRTI. TIBET AWARENESS – THE GREAT MASTERS OF NALANDA. SHANTARAKSHITA. TIBET AWARENESS – THE GREAT MASTERS OF NALANDA. KAMALASHILA. TIBET AWARENESS – THE GREAT MASTERS OF NALANDA. KAMALASHILA. BHAVANAKRAMA – THREE STAGES OF MEDITATION. TIBET AWARENESS – THE GREAT MASTERS OF NALANDA. HARIBHADRA. TIBET AWARENESS – THE GREAT MASTERS OF NALANDA. VIMUKTISENA. TIBET AWARENESS – THE GREAT MASTERS OF NALANDA. 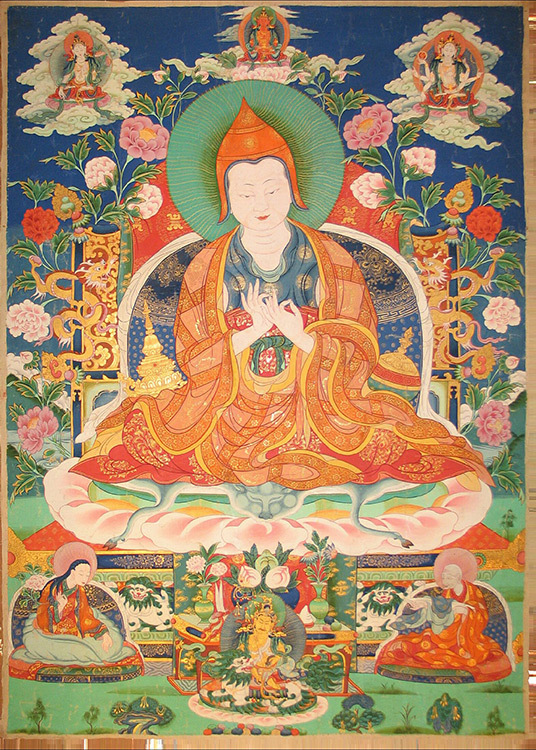 SHANTIDEVA. TIBET AWARENESS – THE GREAT MASTERS OF NALANDA. ATISHA. TIBET AWARENESS – THE GREAT TEACHERS OF NALANDA. ATISHA. TIBET AWARENESS – GREAT MASTERS OF NALANDA. 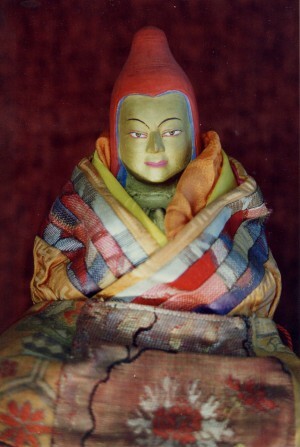 LAMA ATISHA. TIBET AWARENESS – GREAT MASTERS OF NALANDA. ATISHA. TIBET AWARENESS – GREAT TEACHERS OF NALANDA. ATISHA. 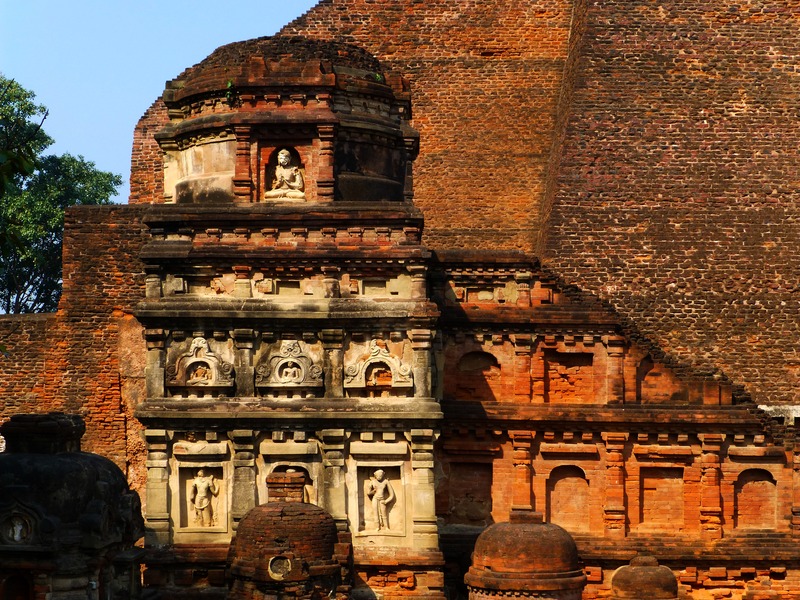 Oregon, USA — Nalanda Monastic University was the greatest center of Buddhist learning in India’s glorious past. 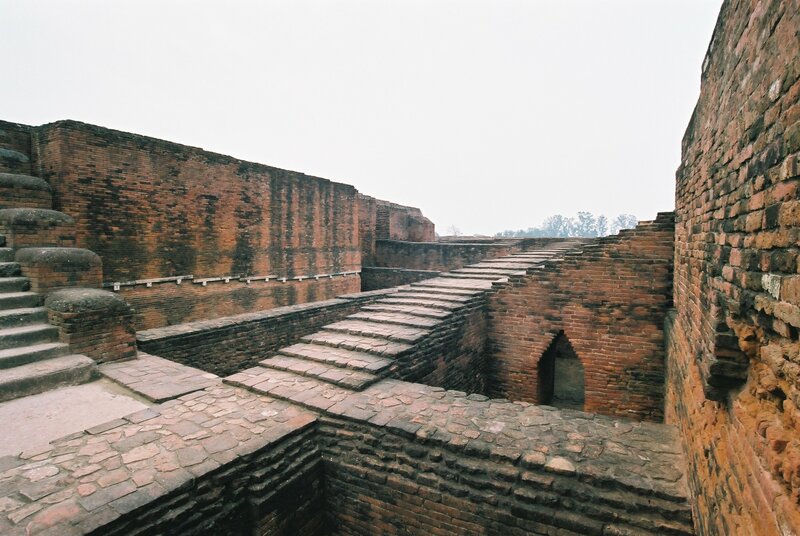 With upwards of 30,000 monks and nuns including 2,000 teachers living, studying and practicing there during its heyday, Nalanda was unmatched. Established during the Gupta Dynasty in the late 5th to early 6th century C.E. under the patronage of the Gupta king Shakraditra, the institution survived for six hundred years, through the Pala Dynasty, until ultimately being destroyed in 1203 by Turkish Muslim invaders. 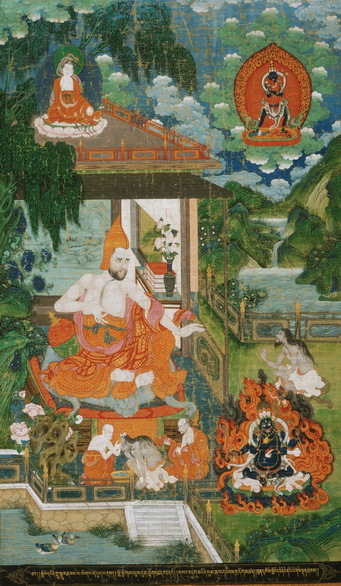 In 1204 the last throne-holder (abbot) of Nalanda, Shakyashribhadra, fled to Tibet. 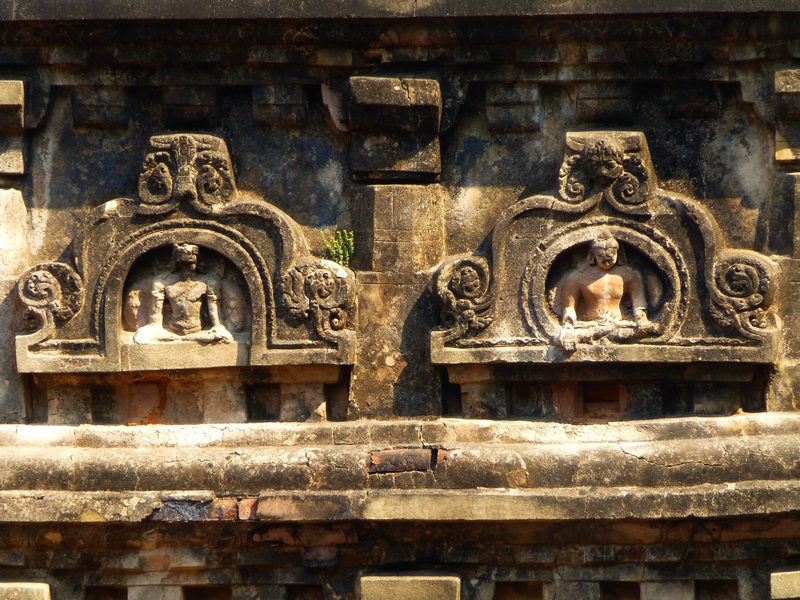 In the intervening centuries, however, many of India’s greatest Buddhist masters trained and taught at Nalanda. 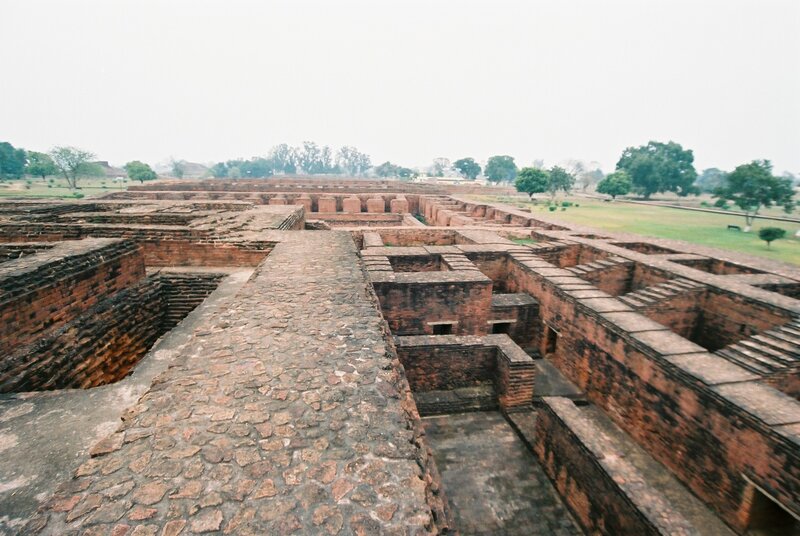 Nalanda’s renown as a center for higher learning spread far. It attracted students from as far away as Greece, Persia, China and Tibet. Although Buddhism was naturally the central focus of study, other subjects including astronomy, medicine (Ayurveda), grammar, metaphysics, logic, philosophy of language, classical Hindu philosophy, non-Indian philosophy and so forth were all regularly studied. Chinese pilgrims who visited Nalanda in the 7th century C.E. give detailed accounts of the physical premises and activities in their travelogues. For example, they describe three nine-story buildings comprising the library that housed millions of titles in hundreds of thousands of volumes on a vast variety of topics! Much like the large Gelug monasteries of Sera, Drepung and Ganden, living quarters were divided according to regions of the world from which the monks and nuns came. 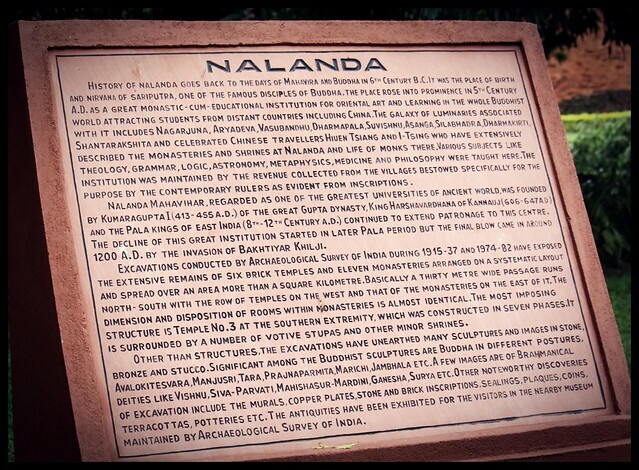 There are clear records of a well-populated Tibet Vihara at Nalanda during the later period. 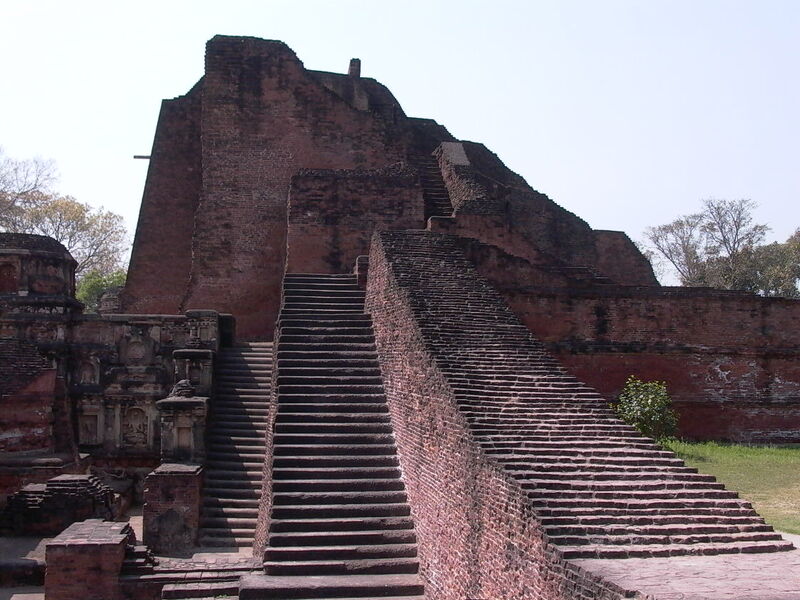 In fact, history reveals that at one point there was a Tibetan gatekeeper at Nalanda. The gatekeepers were traditionally the top scholars/debaters at the institution. Their job was to stand “guard” at the gate and defeat in debate any non-Buddhist who proposed to challenge the scholarship and ideas of the institution. If they could not defeat the gatekeeper in debate, they would not be allowed further into the monastery. 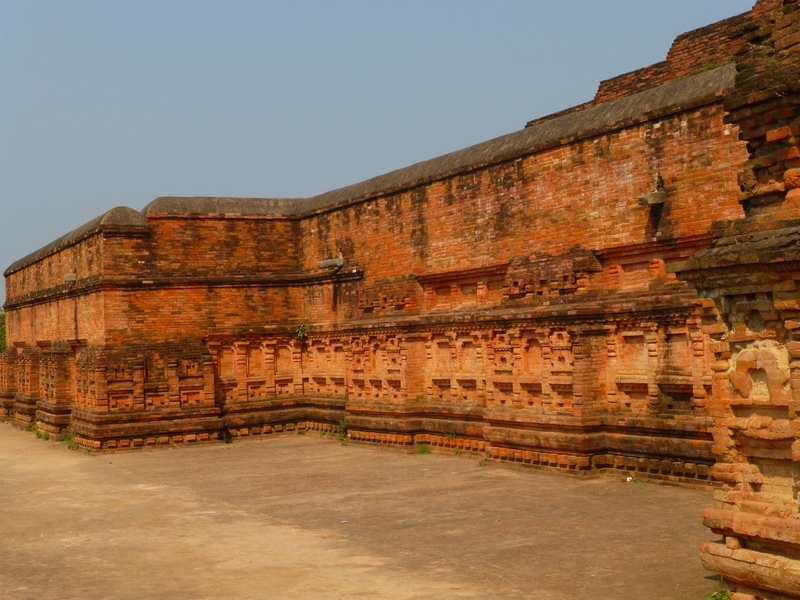 The Seventeen Pandits of Nalanda Monastery refers to a grouping of seventeen of the most important and influential Mahayana Buddhist masters from India’s past. His Holiness the Dalai Lama frequently refers to himself as a follower of the lineage of the seventeen Nalanda masters today. He even wrote an exquisite poem in praise of the seventeen. So who were they? Historically speaking, this particular grouping of Indian masters seems to have become prominent quite recently and to be based on attributions of lam-rim (stages of the path) lineages in Tibet. A likely predecessor to this grouping is an Indian reference to the Six Ornaments of the Southern Continent (i.e., India) and the Two Excellent Ones. These eight form the core of the seventeen. The Six Ornaments first include Nagarjuna (c. 2nd century C.E. ), the revealer of the Perfection of Wisdom Sutras and the systematizer and founder of the Middle Way (Madhyamaka) school of Buddhist philosophy. 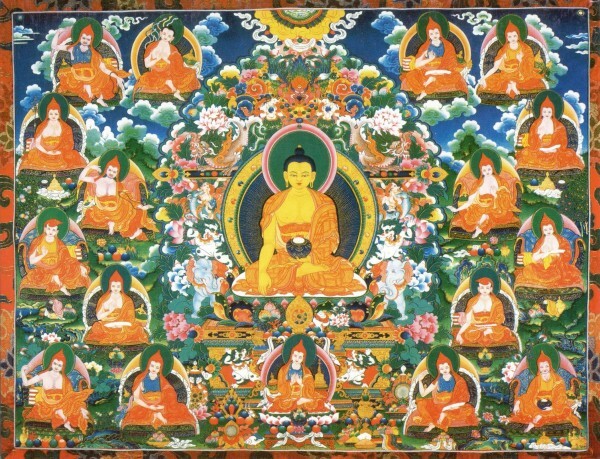 The most famous treatise of his six texts of reasoning is The Fundamental Wisdom of the Middle Way, probably the single most analyzed, commented upon and discussed philosophical treatise in Buddhism’s history. The second of the six ornaments is Aryadeva (c. 3rd century C.E.) who is sometimes referred to as Nagarjuna’s heart disciple and sometimes simply as his first authoritative commentator. 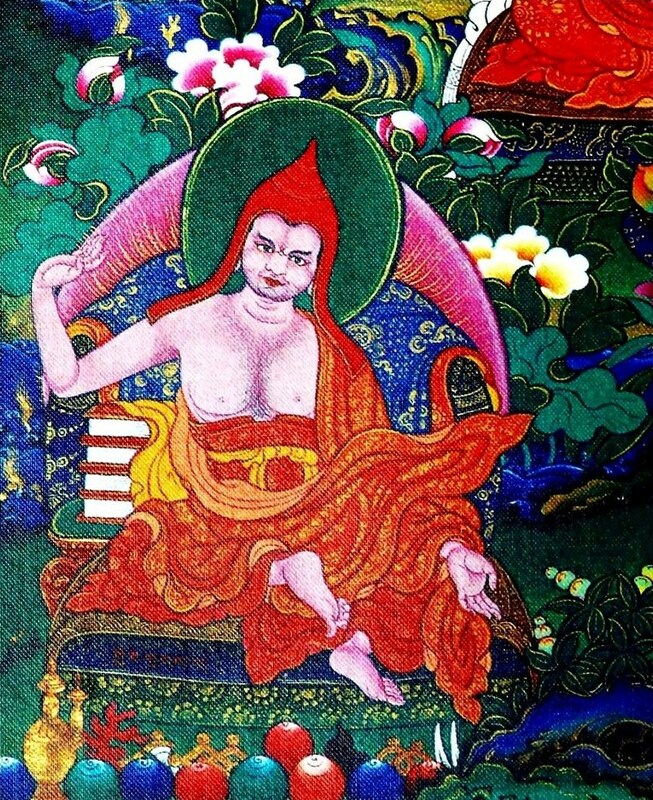 Like Nagarjuna, Aryadeva is universally revered as an authoritative voice for all subsequent Middle Way commentators and is most well-known for his treatise The Four Hundred Stanzas. 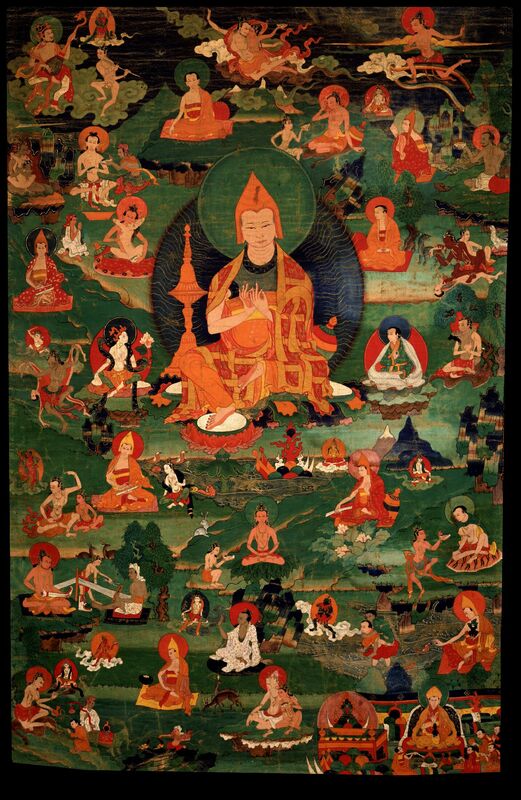 In addition to the two Middle Way school masters, included among the six ornaments are the two earliest masters from the Mind-Only school (Yogachara/Chittamatra): Asanga (300–390 C.E. ), the founder, and his disciple and half-brother, Vasubandhu (c. 4th century C.E.) one of the system’s earliest and most authoritative commentators. 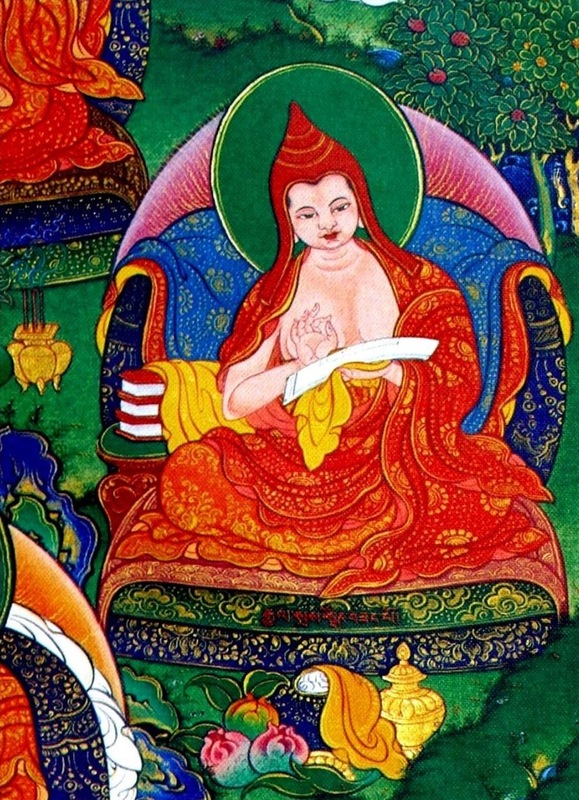 In addition to his own treatises, Asanga is also famous, according to tradition, for retrieving the five Maitreya Buddha texts¹ directly from Maitreya in his pure land, Tushita. 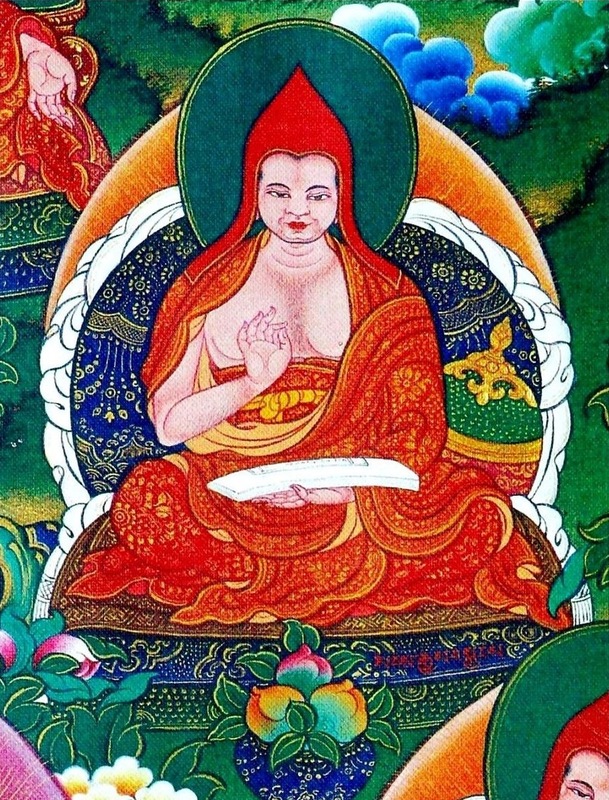 With regards to Vasubandhu, before becoming a leading exponent of the Mind-Only school, he wrote a famous treatise from the perspective of the Great Exposition school (Vaibhashika) entitled The Treasure of Knowledge (Abhidharmakosha) which is utilized extensively in Tibetan scholastic studies. Traditionally, seven years is dedicated to the study of this text in the Gelug geshe curriculum. Two additional Mind-Only school proponents round out the six ornaments: Dignaga (6th century C.E.) and Dharmakirti (600–660 C.E.). The two are most famous as the groundbreakers in Buddhist logic and epistemology. Specifically, they wrote philosophical treatises on the contents and means of accruing valid knowledge. They argued that from the Buddhist perspective there were two sources of valid knowledge: logical inference and direct perception. Much of their writings were detailed elaborations on these topics. 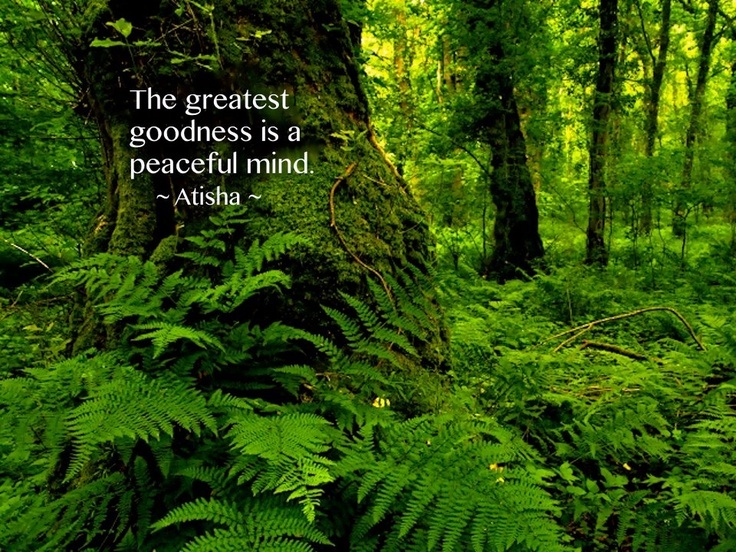 The Two Excellent Ones refers to the two great Vinaya masters: Gunaprabha (c. 9th century C.E.) andShakyaprabha. Gunaprabha was a disciple of Vasubandhu’s and is most famous for his treatise, the Vinayasutra. Shakyaprabha was a disciple of Shantarakshita’s (also among the seventeen) and the other major teacher of vinaya among the seventeen. He is particularly associated Mulasarvastivada-vinaya line which has been followed in Tibet since the time of the early Dharma King, Ralpachen (born c. 806 C.E.). His teacher Shantarakshita began this ordination lineage in Tibet when he ordained the first seven Tibetan monks and founded Samye Monastery. Beyond the Six Ornaments and Two Excellent Ones, are nine additional Indian Buddhist masters, each of whom profoundly impacted the shapes of Indian and/or Tibetan Buddhism for centuries. Buddhapalita (470–550 C.E.) was one of the great commentators on Nagarjuna’s Madhyamaka thought. 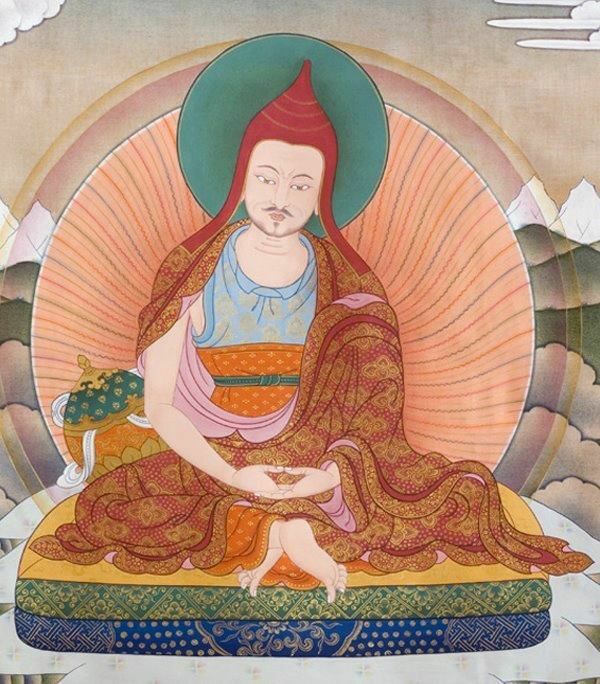 He is the earliest Indian Madhyamaka specifically identified as a proponent of the sub-school of Madhyamaka known in Tibet as the Middle Way Consequence school (Prasangika-Madhyamaka). He received this designation in Tibet due to his use of a form of reasoning that drew out the absurd logical consequences of the philosophical rivals of Madhyamakas when he commented on Nagarjuna’s root text on wisdom. 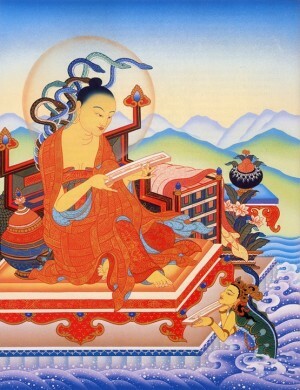 Buddhapalita was subsequently criticized by another Madhyamaka master, Bhavaviveka (500–578 C.E.). He argued that a proper Madhyamaka commentator ought to do more than show the absurdities of other’s views; they also have a responsibility to establish the view of emptiness and to do so with autonomous inferences (svatantranumana). 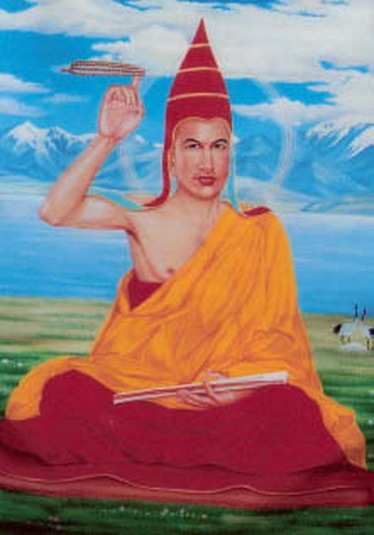 He subsequently became known in Tibet as the “founder” and primary proponent of a sub-school of Madhyamaka known as the Middle Way Autonomy school (Svatantrika-Madhyamaka). Chandrakirti (600–650 C.E.) is revered by many in Tibet as the founder of the Middle Way Consequence school, often regarded as the highest Buddhist philosophical explanation of reality. He famously came to the defense of Buddhapalita’s use of consequentialist reasoning contra Bhavaviveka’s criticism. 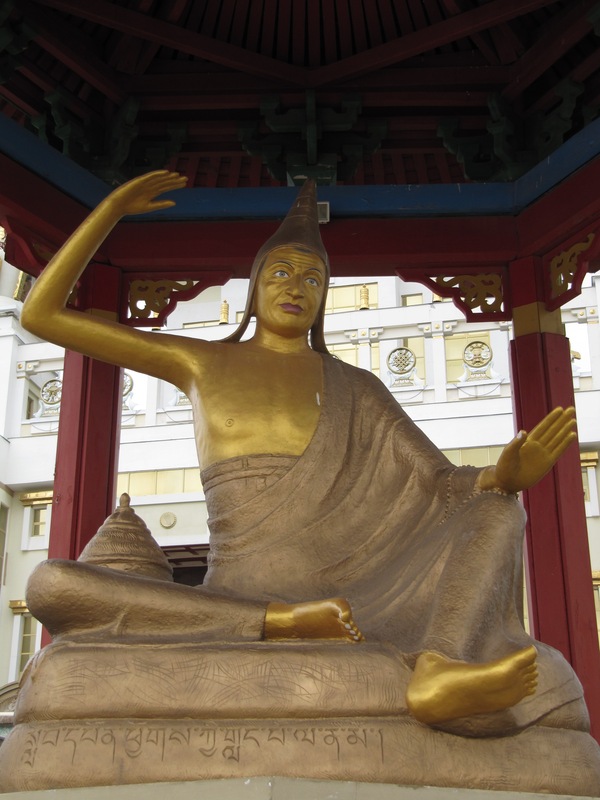 In a line of thinking further developed by Je Tsongkhapa (1357–1419 CE) they argued that a Madhyamaka philosopher ought not to utilize autonomous inferences because the very use of that sort of reasoning entailed the acceptance of an inherent nature in the subject of the argument. Since the existence of an inherent nature in anything was precisely what Nagarjuna was refuting, the use of autonomous inference seemed like a fatal flaw for a Madhyamaka. 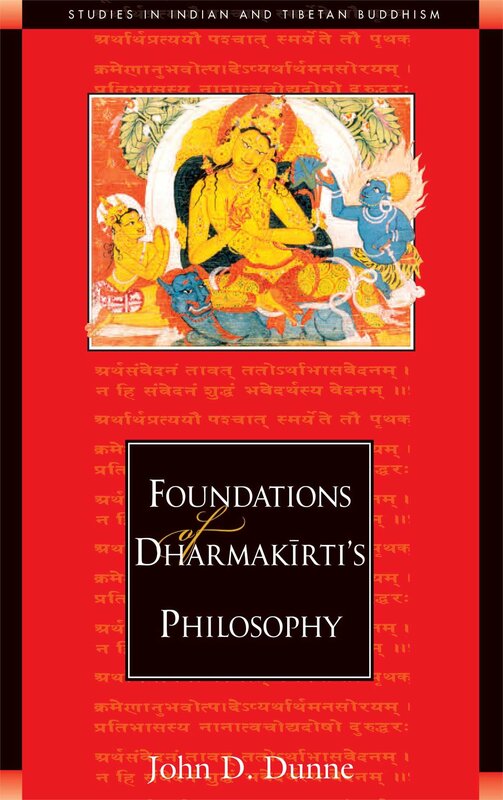 Though historical evidence suggests that Chandrakirti’s views likely did not have extensive support in India until the late period there, by the 13th century in Tibet, his views on a proper understanding of Madhyamaka began to dominate the philosophical landscape and continue to today. Shantarakshita (725–788 C.E.) was a towering figure in late Indian Buddhist philosophy and immensely influential in Tibet. Philosophically, he is famous for integrating the three major lines of Mahayana philosophy into an integrated coherent system. These were the Madhyamaka, the Yogachara and the logico-epistemological thought of Dharmakirti. Beyond India, he spent the last seventeen years of his life in Tibet, ordaining its first monks and serving as abbot of it first monastery. Moreover, probably nobody has exerted a greater influence on Tibetan Buddhism in terms of the way in which Tibetans approach philosophy. 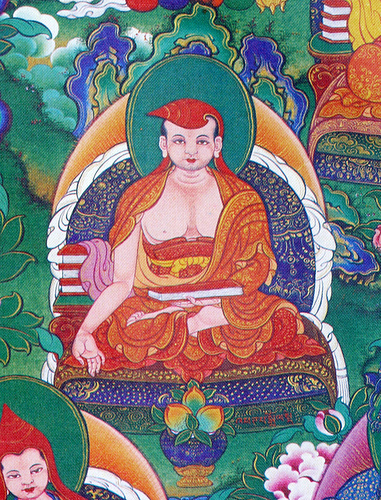 Shantarakshita virtually taught Tibetans how to do philosophy during the early dissemination of the Dharma there. Two of Shantarakshita’s disciples (in addition to Shakyabhadra mentioned above) are also included in the list of seventeen. Kamalashila (c. 8th century C.E.) likewise was an immensely important figure in India and Tibet. Like his teacher, Kamalashila wrote extensively on Madhyamaka and pramana (logic and epistemology) as well as on meditation theory and practice. His three Stages of Meditation (Bhavanakrama) texts are among the most cited in traditional Tibet expositions on the topics. Moreover, also like his teacher, he spent extensive time in Tibet during the early dissemination. He famously and successfully defended the Indian gradual approach to enlightenment at the Great Debate at Samye (also called the Council of Lhasa) against the instantaneous approach advocated by Hvashang Mohoyen, the Chinese master. Tibetan histories often recount that since that time Tibetan have followed the Indian method. Haribhadra (700–770 C.E. 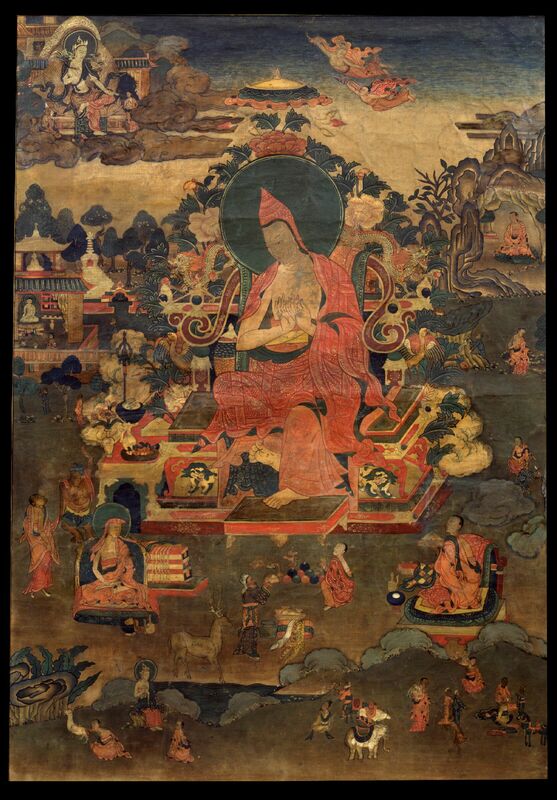 ), the last of Shantarakshita’s disciples included in the group of seventeen, wrote the most famous and commonly utilized of the 21 Indian commentaries on The Ornament of Clear Realizations by Maitreya and the Mahayana path system in general. The other major commentator on The Ornament of Clear Realizations to be included among the seventeen is Vimuktisena (c. 6th century C.E.) whose text Illuminating the Twenty Thousand: A Commentary on the Ornament is likewise extensively cited by subsequent Tibetan authors. 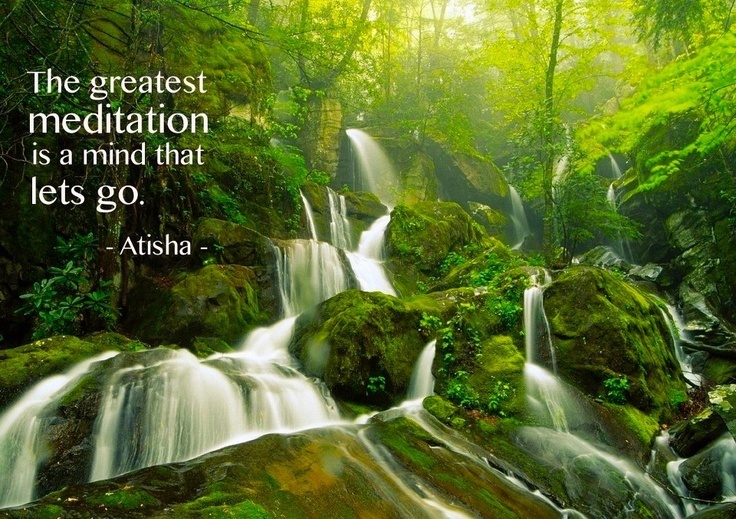 The final master included among the seventeen was the Bengali scholar-adept Atisha (980–1054 C.E. 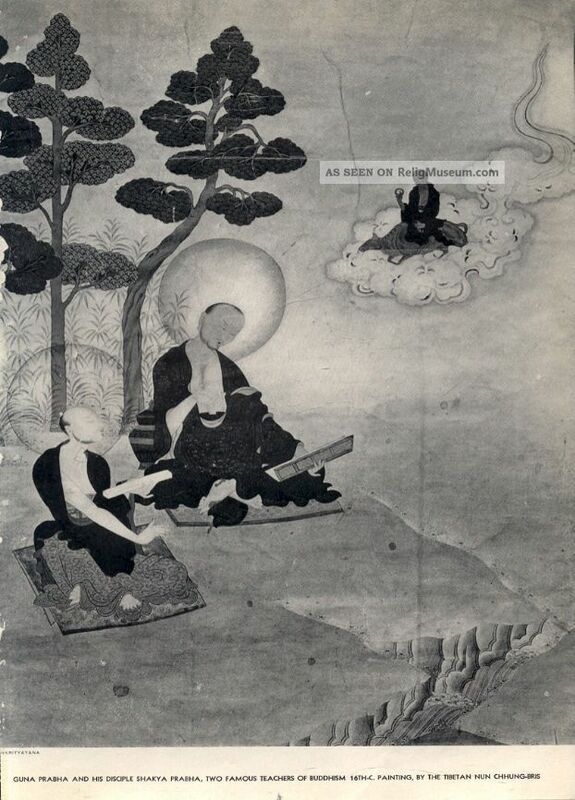 ), who was a critical figure in the later dissemination of Buddhism in Tibet. Like many of the others on this list, Atisha’s impact on the shape of Tibetan Buddhism was immense. 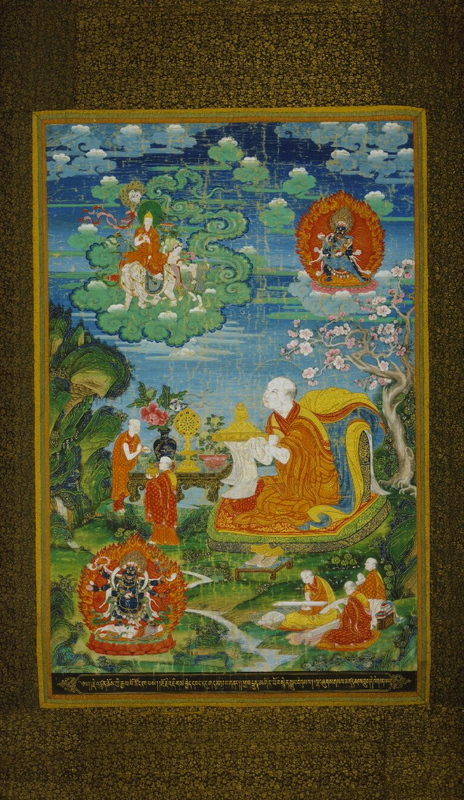 His classic, The Lamp for the Path to Enlightenment (Bodhipathpradipa) is widely regarded as the root text on the graduated stages of the path presentation found in Tibetan classics like Je Tsongkhapa’s The Great Treatise on the Stages of the Path to Enlightenment (also commonly referred to by the abbreviated Tibetan name, Lamrim Chenmo), Gampopa’s Jeweled Ornament of Liberation and Patrul Rinpoche’s The Words of My Perfect Teacher among others. 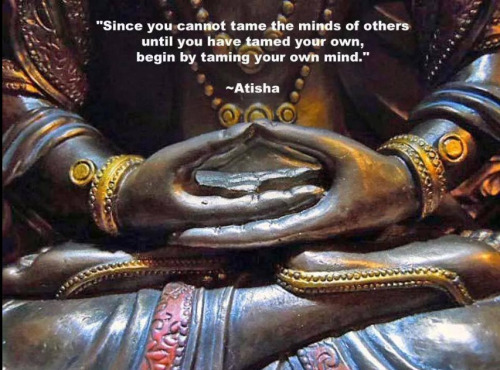 In addition to the stages of the path teachings, Atisha also introduced the lojong, or mind training, tradition of Mahayana practice in Tibet. 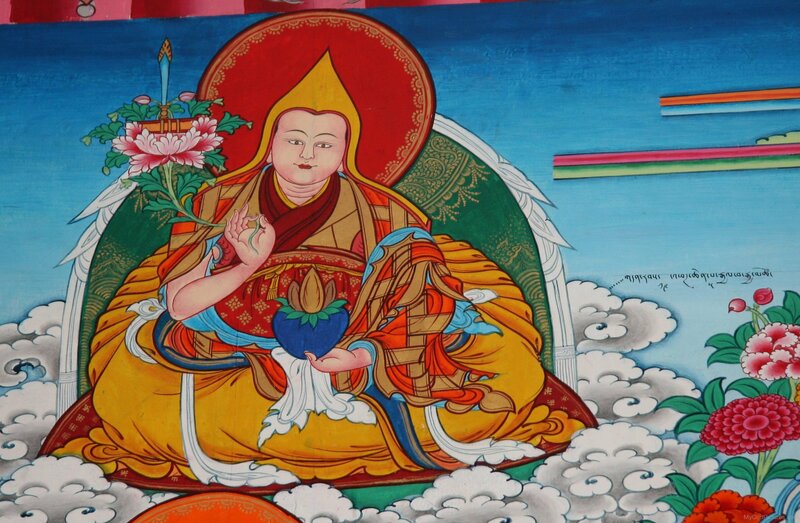 Lojong teachings are quintessential Mahayana teachings in that their aim is to eliminate both the self-cherishing attitude and self-grasping by teaching means to cultivate the altruistic compassion of bodhichitta and the direct realization of emptiness. Like the stages of the path teachings, the mind training tradition is one that is embraced by all Tibetan lineages. 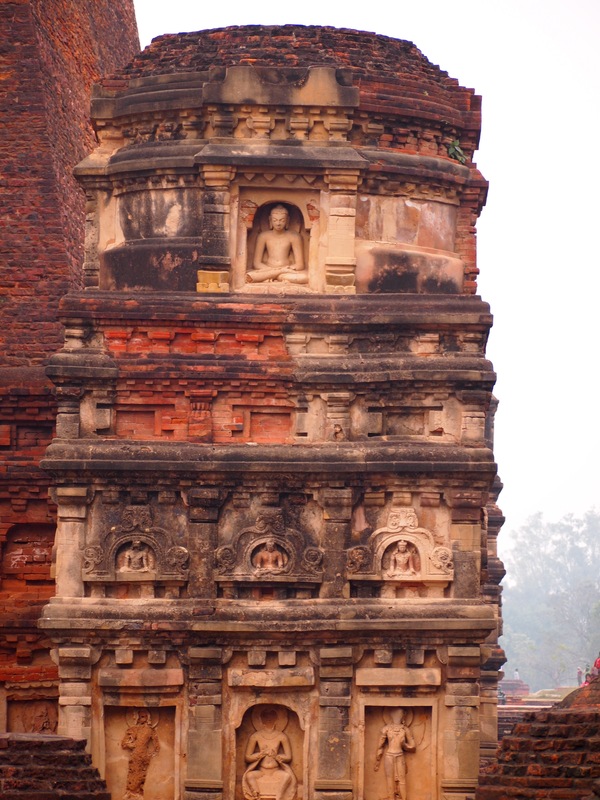 Together the seventeen great masters of Nalanda monastery represent the real high points of Indian Mahayana. The inspiration and teachings of these great masters continue to bless practitioners of the Mahayana to the present day. ¹ The five Maitreya texts are: The Ornament of Clear Realization (Abhisamayalamkara), The Ornament of Mahayana Sutras (Mahayanasutralamkara), Distinguishing the Middle from the Extremes (Madhyantavibhaga), Distinguishing Phenomena and the Nature of Phenomena (Dharma-dharmata-vibhaga), and The Sublime Continuum (Uttaratantra). JAMES BLUMENTHAL, Ph.D. is an associate professor of Buddhist philosophy at Oregon State University and professor of Buddhist Studies at Maitripa College. He is the author of The Ornament of The Middle Way: A Study of the Madhyamika Thought of Shantarakshita along with more than 40 articles in scholarly journals and popular periodicals on various aspects of Buddhist thought and practice. He recently finished work with Geshe Lhundup Sopa on Steps on the Path: Vol. IV, a commentary on the ‘ Shamatha’ chapter of Lamrim Chanmo of Tsongkhapa which is due for publication in the fall. Copyright © 2015 LankaWeb.com. All Rights Reserved. TIBET AWARENESS – GREAT MASTERS OF NALANDA. BUDDHIST CENTER OF LEARNING WHICH FLOURISHED FROM 427 TO 1197 CE. AT NALANDA, BIHAR, INDIA. TIBET AWARENESS – GREAT MASTERS OF NALANDA UNIVERSITY. 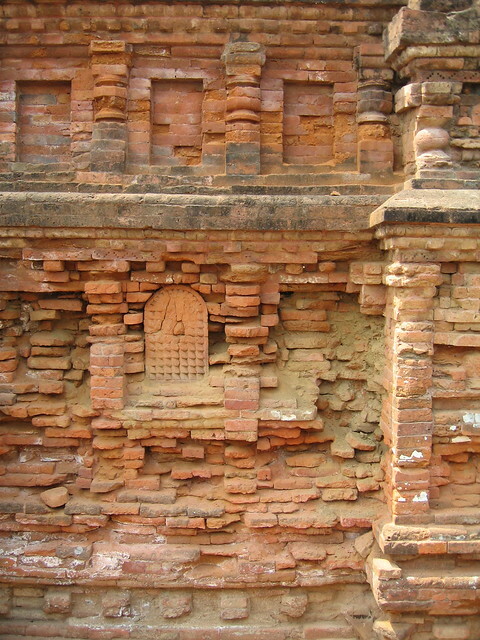 NALANDA TRADITION OF MAHAYANA BUDDHISM. TIBET AWARENESS – SEVENTEEN GREAT MASTERS OF NALANDA MONASTIC UNIVERSITY. PROPONENTS OF MADHYAMAKA OR MIDDLE WAY. 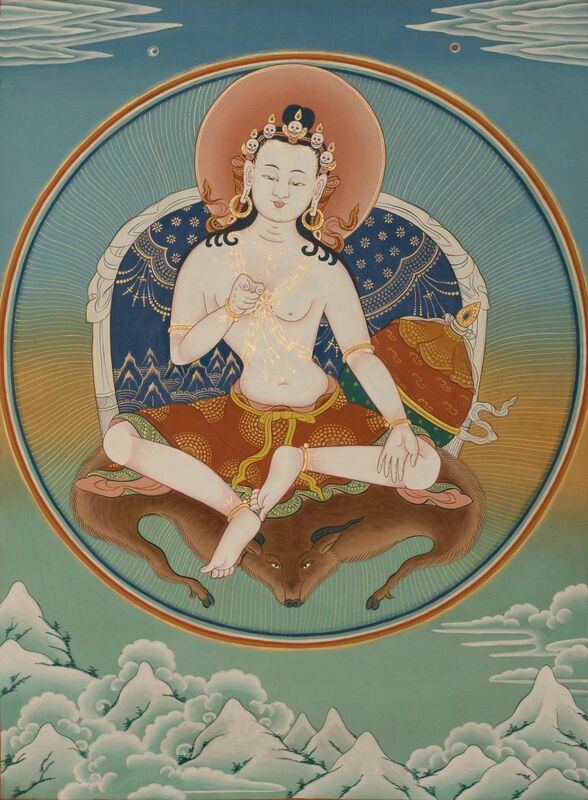 TIBET AWARENESS – SEVENTEEN GREAT MASTERS OF MIDDLE WAY BUDDHIST TRADITION OF NALANDA MAHAVIHAR. THE FOUNDATIONS OF TIBETAN BUDDHISM. 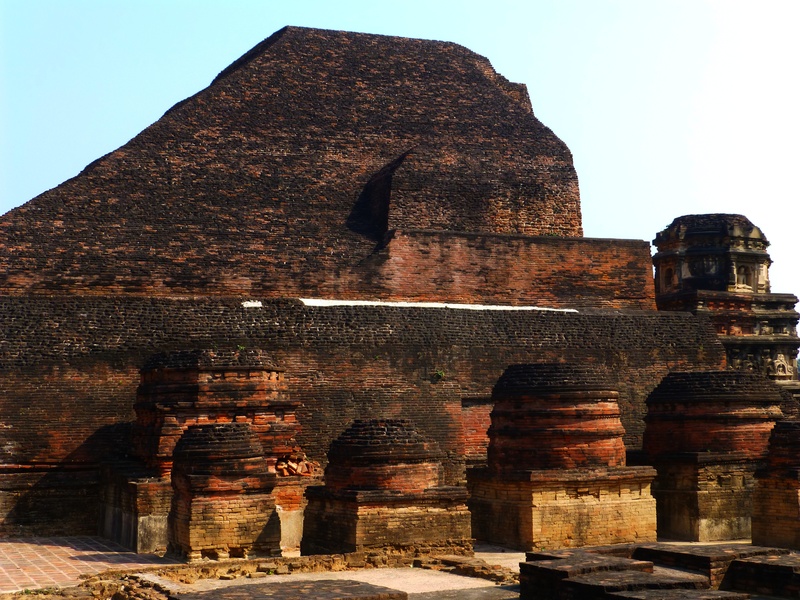 TIBET AWARENESS – SEVENTEEN GREAT MASTERS OF NALANDA MONASTIC UNIVERSITY. TIBET AWARENESS – SEVENTEEN MASTERS OF NALANDA MONASTIC UNIVERSITY. TIBET AWARENESS – SEVENTEEN MASTERS OF NALANDA MONASTIC UNIVERSITY. THIS CENTER OF BUDDHIST LEARNING FLOURISHED FOR 600 YEARS. THE CAMPUS COMMUNITY OF 30,000 MONKS, NUNS INCLUDED 2,000 TEACHERS. 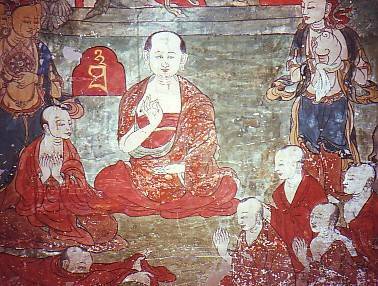 TIBET AWARENESS – SEVENTEEN MASTERS OF NALANDA MIDDLE WAY, MADHYAMAKA BUDDHIST TRADITION. THE FIRST RESIDENTIAL UNIVERSITY OF WORLD. TIBET AWARENESS – SEVENTEEN GREAT MASTERS OF NALANDA BUDDHIST TRADITION. 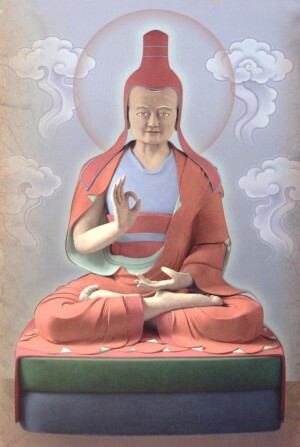 TIBET AWARENESS – SEVENTEEN GREAT MASTERS OF NALANDA BUDDHIST TRADITION. 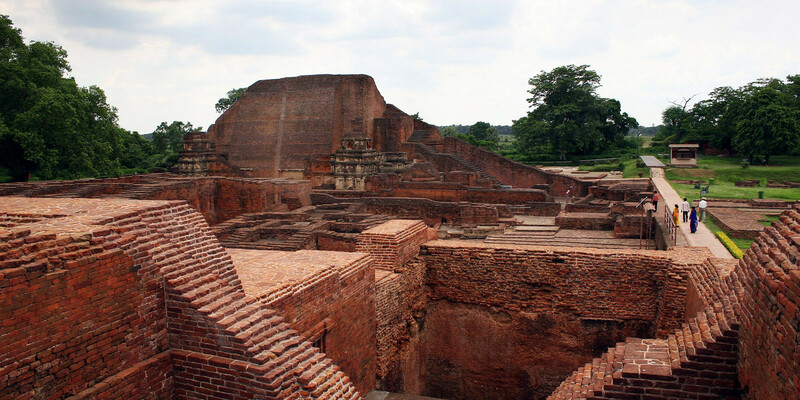 INDIA REOPENED NALANDA UNIVERSITY 800 YEARS AFTER ITS DESTRUCTION IN 1203 CE. TIBET AWARENESS – GREAT MASTERS OF NALANDA UNIVERSITY. 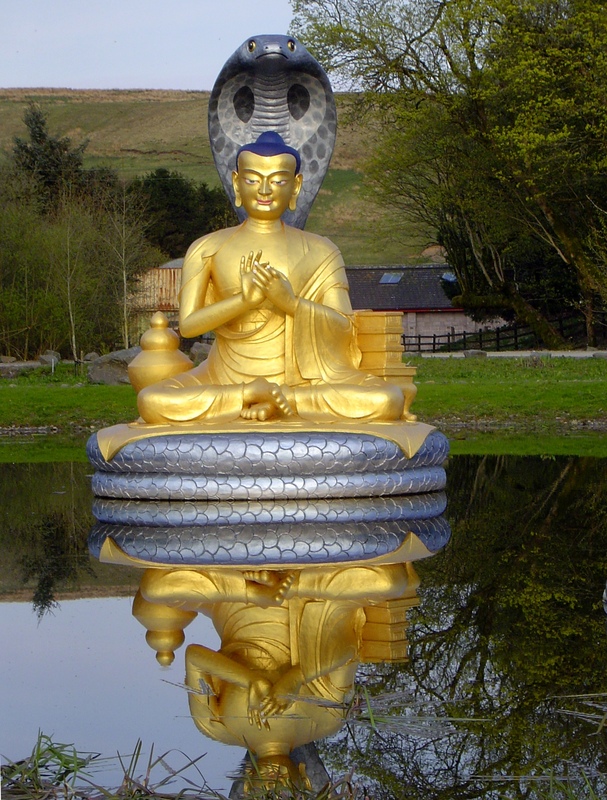 TIBET AWARENESS – SEVENTEEN GREAT MASTERS OF MIDDLE WAY BUDDHIST TRADITION OF NALANDA MAHAVIHAR. 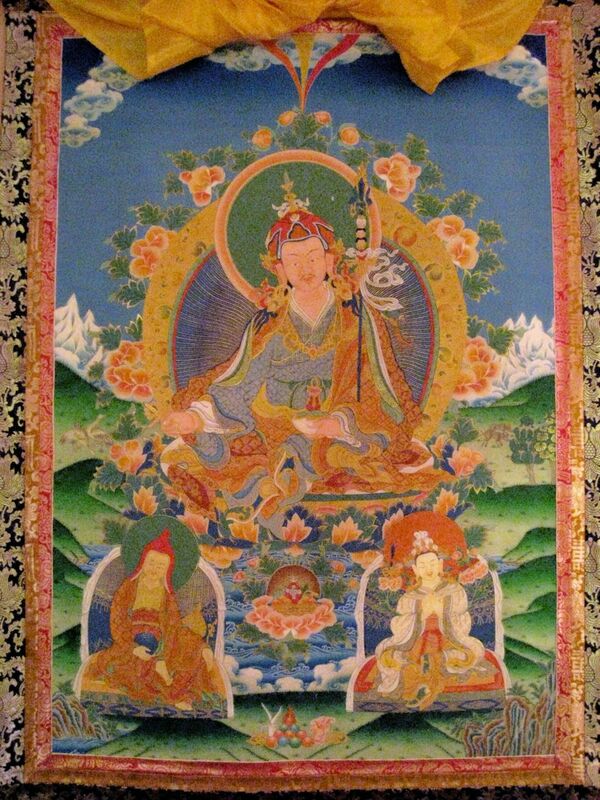 Amazing pictures and beautiful thangka paintings. I appreciate your work in promoting traditional arts. Keep Up your good work.